I don't even know if there are still any eyes out there in the great chasm of the internet that still take the time to peek at my blog. If not, that's ok. If so, that's ok, too. For now, because of the busy-ness of my life, this will just be a quick journaling outlet as I feel like it and have time. So much has happened since we moved to Syracuse. After a long (more than a year, start to finish) process we have been approved for foster care here in NY. We have had an almost two month placement with two bundles of energy, three and four years old. It kept us on our toes to be sure. Just this last weekend, they were reunified with a relative, so our house is very quiet again. I miss the extra hugs, kisses, music, laughter, and play. I don't miss quite so badly the fits, tantrums, bed-wetting, and total lack of alone-time. Every time we say good-bye, I think that perhaps it will hurt a little less. Unfortunately, it doesn't. Like we've said to so many people, so many times, "If you don't hurt when they leave, you probably aren't doing the job right." We do our best to do the job right, and boy, does it hurt when they leave. At some point maybe I'll type up a post full of advice, but for now, I just needed to get some words on the page. Jason works full time as a driver for elderly in addition to pastoring. He is growing into a better pastor every day, and keeps very busy between his two jobs. I've been following the Trim Healthy Mama eating plan for a while now. I have lost about 40 pounds, and have been encouraging my husband to join in. He has dabbled around the edges, but today, he decided to give it a go. I wanted to make him something to celebrate, so I tweaked an old recipe of mine to make his favorite cookies on plan. 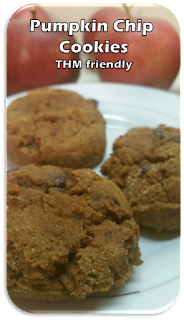 This is a great fall recipe because of the delicious pumpkin flavor! Over the past year, I’ve been thinking about this day. Last year, Jason asked me if I would be willing to share some thoughts for Mother’s Day and I told him that I couldn’t, that it would be too painful. This year, in many ways, it is even more painful. You know about the pain that our family has just recently been through as we lost another child. My heart has been broken once again, and once again, my arms are empty on Mother’s Day, but as I thought about Mother’s Day, God spoke to me about taking some time to honor the ladies around me who have come to mean so much to me. Men, I realize that this is largely focused toward the ladies, but I just want to take a moment to remind you of the sacrifices that the mothers in your life make. Whether it is the woman who gave you birth, the woman who gave birth to your children, or your sisters and others around you who have mother’s hearts, they are worthy of your gratitude, admiration, and honor. Let them know that you appreciate them today! I’d like to share a passage that pastors all around the United States are likely reading today, Proverbs 31:10 - 31. It shows us God’s ideal for women and gives us women something to aspire to daily. Ladies, I’d like to challenge you. As we read, evaluate yourself. How are you doing in these areas? Let the Word of God speak truth to your heart. Wow! What a challenge that passage is to us, ladies. Are we that industrious, that trustworthy, that Christ-like? Do we run our homes smoothly? Are our words wise and kind? Are we good stewards? Are we worthy of our husband and children’s praise? If we aren’t is it our daily goal to be more like that virtuous woman? I pray that it is. Today I’d like to take some time to honor the mothers in our midst. I realize that it doesn’t take giving birth to have a mother’s heart. However, there is a special honor that comes from giving birth and bringing a child into this world, and we want to honor those of you who have done that. You have given birth, that in itself is worthy of commendation. The physical pain that you went through is just a token of the tremendous love you feel for your children and the sacrifices you make for them. Remember those “little” years? The messes, the interrupted quiet time, the diapers, the boo-boos, and the tears of frustration after yet another outfit ruined because of spit-up, food stains, or muddy handprints. Those years, although filled with hard moments, were the years where you shaped your child’s future. During those impressionable years, you taught your children how to act, how to react, and how to love others and love Jesus. You nurtured them. You loved them. I think Hannah of the Bible must have especially cherished those little years. As she prepared to give her son away for God’s service, I can only imagine how she made a choice to make memories she could hold forever. Samuel was God’s faithfulness to her in human form. Every single moment she had with him was a gift. May you mothers of little ones realize that your child is a precious gift and that those “little” days you have with them now are fleeting and special. We honor you for your tears, your sleepless nights, and your patience. We pray that God will give you strength and courage. We pray that he will encourage you and give you joy in the sweet moments you are experiencing. Then came those teenage years! You showed your love in a different way now. Sometimes, it was by being the “bad” parent in your teen’s eyes, who wouldn’t let your child do what “everyone else” was doing. Sometimes you showed your love by stepping back and letting your independent youngster learn the hard way when it would have been easier to just “tell them a thing or two.” Whatever the case, you sacrificed for them, you taught them important life lessons, you worried about them, and you loved them. Some of you are in the midst of that now. You are choosing to follow Proverbs 29:15 which says, The rod and reproof give wisdom: but a child left to himself bringeth his mother to shame. It may seem that the reproof is endless, but you are consistently teaching your children to be Christ-like. Do you think Samson’s mother faced moments like you do? Moments when she worried about his choice of a wife, worried about how lightly he seemed to take his faith, worried about the choices he made? We honor you for your sacrifices. We honor you for your dedication to raising your teens to be adults who are responsible, honest, and hard-working. We honor you for teaching them to love Christ and seek His will for their lives. We pray that God will bless your efforts and give you encouragement on those days when it seems like they just won’t ever mature. We pray that you will be a godly example to those teens so that they look for a wife who follows your example of godliness or they become that wife who loves her husband and her children as you do. Some of you are in another stage of life. You are now mothering from a distance as your children begin lives of their own. You worry from afar, spend hours in prayer, and give advice when it is welcome. Your children are learning what it means to be parents themselves, and now with that experience, hopefully they appreciate your sacrifices even more. You may have had the joy of welcoming and spoiling grandchildren. I think of Timothy’s grandmother, Lois who passed her faith down, first to her daughter, and then to her grandson. What a privilege you have! What a responsibility! Your grandchildren look up to you, and you can show them to Heaven. You can be Jesus to them! We honor you. You honor you for your wisdom, your example, and your guidance. We honor you for your love for those little grandkids and your guidance in their lives. We pray for you as at times you have to watch them make choices you don’t agree with. We pray for you as you carry a burden for the ones who have gone astray. We pray for you as you teach your grandchildren about faith and family. Did you know that Anna Jarvis, the lady who founded Mother’s Day was never a mother? She was a loving aunt and devoted daughter who lobbied congress to make the day a holiday because of a suggestion her mother had made before her death. Anna had many nieces and nephews and loved them dearly. There are some here this morning, who never had the privilege of giving birth. However, that doesn’t mean they don’t have a mother’s heart. They have reached out to those around them and nurtured and protected. They may be a mentor, a favorite babysitter, a loved aunt, a step-mom or grandma, a foster or an adoptive mom. Whatever the case, we want to honor your mother’s hearts. GOD CARES ABOUT CHILDLESS WOMEN. He shares their stories in His word. They have a part in His plan. YOU have a part in his plan. God cares about you and loves you! We honor you for fulfilling God’s plan for your life, even in the hard times. We honor you for giving those tired mamas a break, for lightening their load, for lending a listening ear. We pray for you during those moments when you feel alone or as though you don’t have a place to belong. We pray for you as you try to understand why God’s plan for your life seems so different to His plan for those around you. There may even be those here who know the pain of giving birth, but also know the greater pain of losing that child, whether through death, or through giving that child up to someone else’s care. We realize that whether you experienced the joy of parenthood for moments, weeks or for years, YOU ARE A MOTHER. The pain that you go through is not lost to God’s attention. God knows. He cares. When Mary was grieving the loss of her Son as He died on the cross, God had a plan. Christ made sure that someone would take care of her, help her through the pain. He wants to do that for you as well. Let God wrap His arms around you. Give your pain to Him. He understands. We honor you and grieve with you. We pray that God will comfort you and give you peace. We pray that when your arms feel empty, your heart will be full of God’s love and faithfulness. In closing, I’d like to share an article that I found a few years ago as I sat at home on a Mother’s Day Sunday morning. It was shortly after we were to have a foster placement. The placement fell through and I was mourning. Mourning the loss of what could have been and mourning my empty arms. That Sunday, I was physically sick because of the emotional pain I was going through, and a friend of mine shared this with me. It comes from Amy Young who writes a blog called Messy Middle. Thanks for taking the time to read my thoughts. May your Mother’s day be special as you celebrate the love of the mothers in your life! Feel free to share my thoughts with a friend who would appreciate them. My school keys, my PE whistle, a note from a parent, and some grading that needed to be done. They lay on my desk before me as painful reminders of what I’d be giving up. My Heart’s desire since my memories began was to teach. After living that dream for eight years of development, enjoyment, and precious memories, now the possibility had arisen that my dreams were going to be sacrificed. Through circumstances not of my own choosing, the doors of the local church my husband was pastoring would soon be closed to us. To my husband’s excitement however, God was opening new doors. In a conference with several open churches, my husband was now the only available pastor. That meant we had calls from multiple churches for trial sermons. The only problem was that none of the churches were local. Although we didn’t know God’s will for our lives yet, it appeared as though we were being led in a new direction. Boxes had been sitting in our living room. Packing them seemed to me to symbolize packing away my life, my dreams, my goals. They were empty. It was painful to think of once again packing away memories and hopes. My heart hurt each time I walked past and noticed the empty boxes. Now I sat at my desk thinking about the future. Hot tears poured from my eyes and coursed down my cheeks as I sat and surrendered. I surrendered my ambitions, my aspirations of career advancement, and my lack of control. “Yes,” was my cry. Where God was going to lead us, I had no clue. I still don’t. But what sweet peace there is in that full consecration to God’s will. I had surrendered with my head and my words weeks ago, but my heart was not so easy. You see, when you are living your dream, sometimes it’s hard to fathom that God could have a MORE blissful, more fulfilling future for you. When you’ve poured your heart into that dream job, into those precious souls you’ve reached, it’s hard to be torn away, even if there are so many others who need your touch. It’s kind of like a child whose parent tells them to put away their toys and get in the car. The child was perfectly happy with those toys. However when they submit to their parents will, they are overjoyed to find that their destination is the zoo. A greater joy awaited them when they followed their parent’s plan. What if they had refused to give up the toys they were holding onto? What if I refuse to let my sweet Savior guide me? Would I be happy? Perhaps for a time. Would I miss out on that greater joy? Right now, I don’t know what God’s plan is. I don’t know if He is going to lead us away from this place, or if He will show us that His will for us is to stay put. Whatever the case, my will is to follow His will. I’m content to rest in the knowledge that God has a better plan than my human plans. What a consolation and peace that brings! Now, if you’ll excuse me, I have boxes to pack. I don’t know where we’ll be going or what we’ll be doing, but I must prepare for God to take us to our next stopping point on our journey to our final destination, Heaven. I’ll keep you posted as our journey continues.